Researchers found that younger adolescents and those who reported more frequent anxiety or depression symptoms experienced their best next-day moods after getting more sleep the night before as compared to older youths and those with fewer symptoms. Sleep problems contribute to a number of mental health issues in adolescents, researchers say. But a lingering question is whether some teens need more — or less — sleep than others to be healthy and at their best. A new UCLA study in the Journal of Clinical Child and Adolescent Psychology finds that there are differences among teens in how much sleep they need to maintain the best daily mood. Few teens function well on less than seven hours of sleep a night; more than 11 hours is also not optimal for the vast majority of teens. 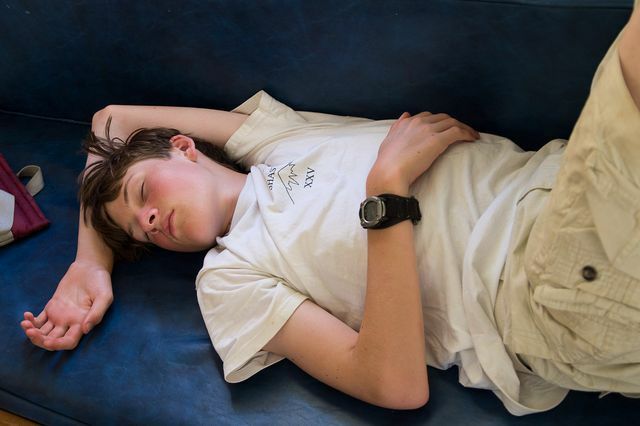 Most teens need eight to 10 hours of sleep, the researchers found. To study the relationship between sleep duration and next-day mood, researchers recruited 419 Los Angeles ninth- and 10th-graders. For 14 days, the teens completed three-page-long daily checklists before going to bed and answered questions about the previous night’s sleep and the current day’s mood. To encourage accurate, daily reporting, the teens folded and sealed each day’s checklist, stamping the seal with an electronic time stamper. Teens were offered movie passes for properly completing their checklist tasks. Researchers found that younger adolescents and those who reported more frequent anxiety or depression symptoms such as crying, worrying and fatigue, experienced their best next-day moods after getting more sleep the night before as compared to older youths and those with fewer symptoms. Researchers said younger adolescents and those who report clinically significant levels of anxiety and-or depression symptoms may need extra hours of sleep to reach peak functioning during the day. Fuligni said there is a need for follow-up research that studies individual differences in sleep needs for different aspects of health and functioning. His previous work hints that sleep targets for optimal mental health and optimal academic performance may differ. The study’s other authors are Sunhye Bai and Jennifer Krull, both of UCLA, and Nancy Gonzales of Arizona State University. The research was supported by funding from the Eunice Kennedy Shriver National Institute of Child Health and Human Development and the UCLA California Center for Population Research, which is supported by the National Institute of Child Health and Human Development.